Some great examples of party games that almost everyone knows are Jenga, Taboo, and Apples to Apples. These are games that are very simple to learn and play so a wide variety of gamer types can play them. They tend to work best with a larger amount of people (the more the merrier!) and they exist for the sole purpose of being loads of fun. These are the types of games that will have you smiling and laughing the whole time you’re playing them. Chances are you’ve played at least one of games I previously listed, but there are a lot more games that fall into the “party” category that you may want to check out the next time you need a game for a bigger group of people! Winner of 2016’s Spiel des Jahres, Codenames is a spy-themed word association game. Players split up into two teams and one member of each team becomes the Spymaster. The game consists of a 5×5 grid of words with each word corresponding to either the red team, blue team, brown civilians, or the black assassin. However, only the Spymasters know which words are what color. Their job is to get their teammates to guess their team’s words faster than the other team. The catch is that the Spymaster’s only clue is a single word and a number of how many cards that word applies to. If either team guesses the assassin, that team immediately loses. One of my favorite parts of this game is playing as the Spymaster. I find it really enjoyable to try to come up with good clues for my teammates. Of course, it also helps to know your teammates. For example, I was once playing Codenames with a group of my college friends and I was trying to get them to guess the words “tower” and “hotel.” I couldn’t simply give the clue “building, 2” as there was another building in the grid that belonged to the opposing team so I had to come up with something more clever. Instead, I gave the clue “terror, 2” knowing that one of my teammates, a huge Disney-lover, would make the connection between my clue and the words I wanted her to guess because they all apply to the “Tower of Terror” Disney park ride. 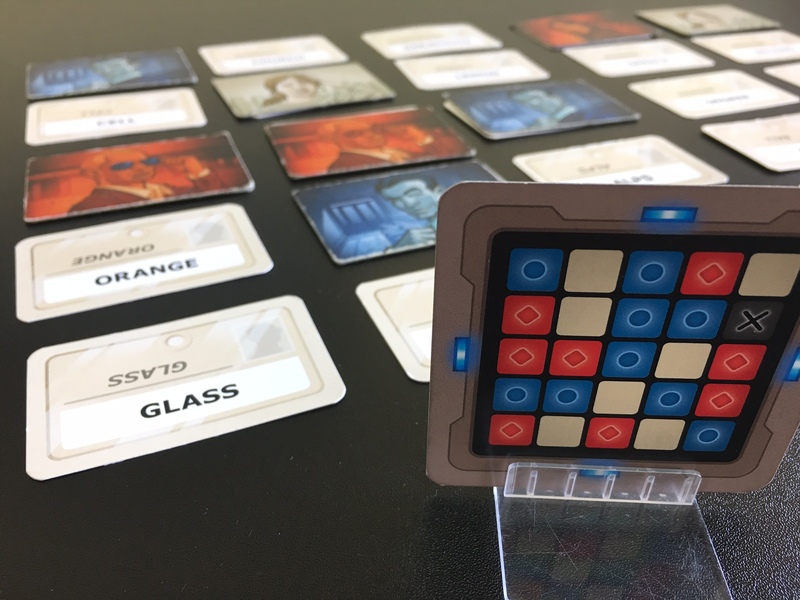 Codenames has been called the greatest party game of all time—and with good reason! Even if you think you aren’t very good with words, I promise it’s tons of fun. There have been many times that we’ve taught Codenames to a group only to find them still playing it hours later. It’s great for any type of group as well whether it’s a group of adults, teenagers, or even a family. As the back of the box says, “win or lose, it’s fun to figure out the clues” which really is what Codenames is all about. When suggesting Cash ‘n Guns to people, the first thing I tell them is that they get to shoot at their friends with foam guns; needless to say, people are instantly interested. After completing the “robbery of the century,” the gangsters of Cash ‘n Guns now have to share the loot. Each player takes on the role of one of these gangsters and, after eight rounds, the gangster with the most loot wins. The first thing players do each round is choose whether or not they are going to be using a real bullet or a blank; however, each player only has three bullets to last them the whole game. After choosing a blank or a bullet, players simultaneously choose another player to point their guns at. At this point, you may or may not have a gun pointed at you and you have to decide if you want to stay in the round and risk getting shot or duck out of the round and forfeit any loot. If you choose to stay in the round and get shot, you take a wound (three wounds and you’re out of the game!) and are unable to take loot. Players still in the round after everyone reveals their bullets or blanks are then allowed to take from the pile of loot. 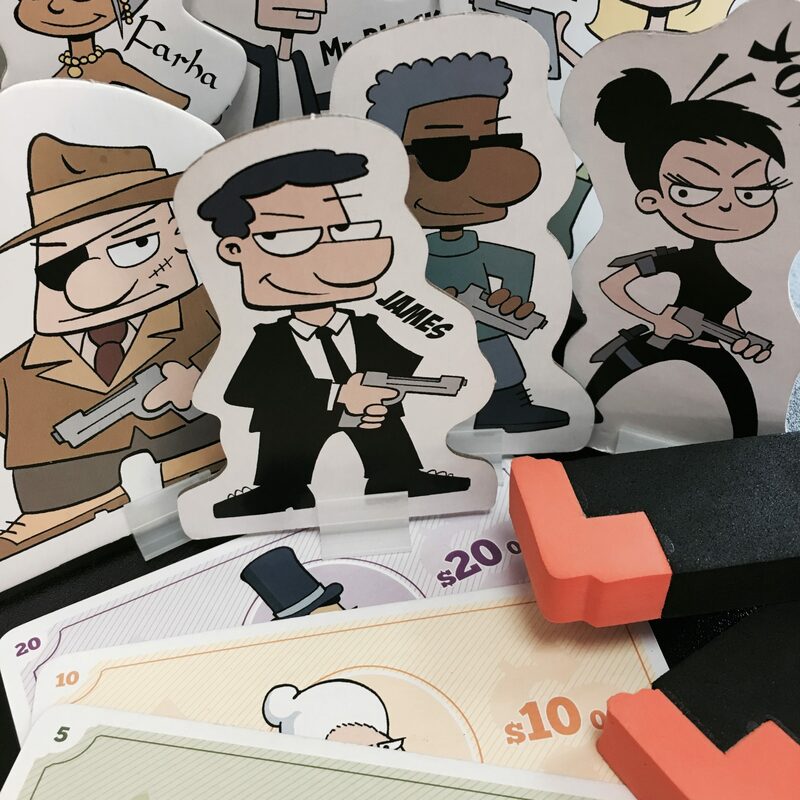 When it boils down to it, Cash ‘n Guns is a bluffing game. Just because one of your opponents is pointing a gun at you doesn’t necessarily mean that you will get shot and that’s what you have to figure out. The reason I like Cash ‘n Guns so much is that it’s very easy to play (and easy to teach!) and everyone I’ve recommended it to ends up having a great time. You can always hear a lot of laughter coming from a table where Cash ‘n Guns is being played. Flick ’em Up is a game set in the old west and, just as the name implies, the main mechanic of the game is using your finger to flick small discs across the table. Players split into two teams-either the outlaws or the cowboys-and play out one of ten scenarios (or you can make up your own!). 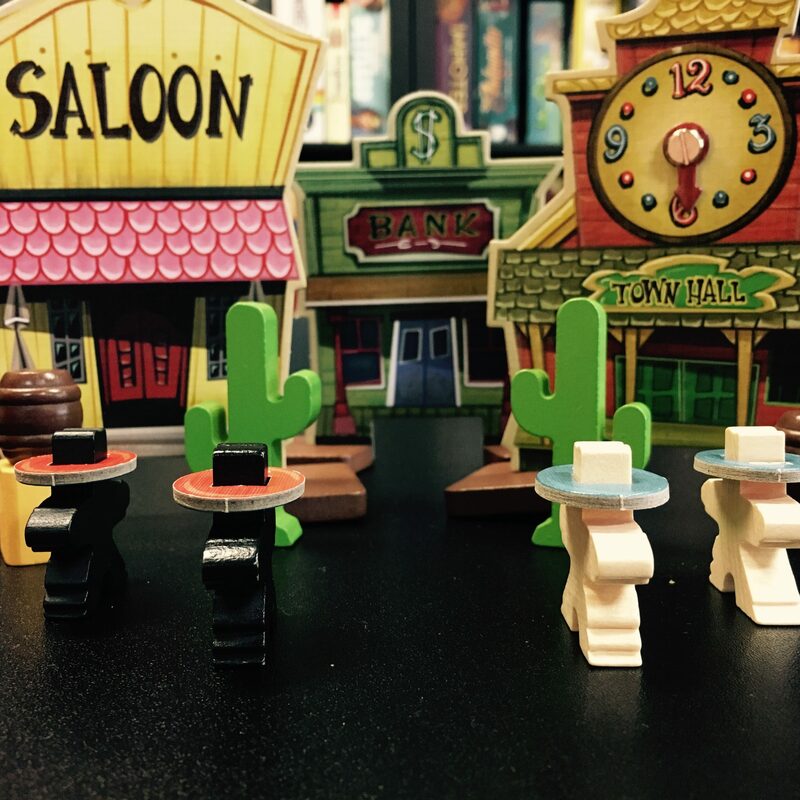 The game comes with cardboard stand-ups of different buildings to populate your western town as well as small cowboy figures. Each scenario is different. In one you may be tasked with killing a certain number of the opposing team while in another you may be trying to collect a certain amount of gold. No matter the scenario, the flicking mechanic remains the same. Players will use a brown disc to move their characters in order to pick up items. Some of these items will be guns which you can then use to “shoot” (flick another disc) at your opponents. Flick ’em Up can be a lot of fun for bigger groups of people. We tend to set the game up on one of our larger tables so players have plenty of space to move around and flick their discs. Everyone who has played it seems to have a lot of fun with it. If you’re interested in playing this fun game, join us on April 1st for our Anniversary Party where we’ll be hosting an Epic version of Flick ’em Up with more space, more terrain, and more fun! My mom really likes playing board games with the family, but, of course, the games she wants to play are the same old games that we’ve been playing forever. Slowly, but surely, I’ve been trying to introduce them to more and more games. Let’s face it: playing board games with non-gamers can be… well, frustrating. They’re used to games like Life, Monopoly, or Sorry where the rules of the game are basically “Roll, move, complete anything that must be done on the space you have landed on.” Anything more complicated than that can be confusing for them if you try to introduce it too quickly. But there are a lot of games that make for great introduction games for people who never have ventured beyond Clue and Scrabble territory. Here are some of my favorite games to play with my own family of non-gamers. Somewhere down the line, gamers pretty much unanimously decided that Catan is the game to play when introducing non-gamers to the world of board gaming. The reason for this is that it is incredibly simple to understand, but also surprisingly very strategic, making it fun for both newbies and more experienced gamers. 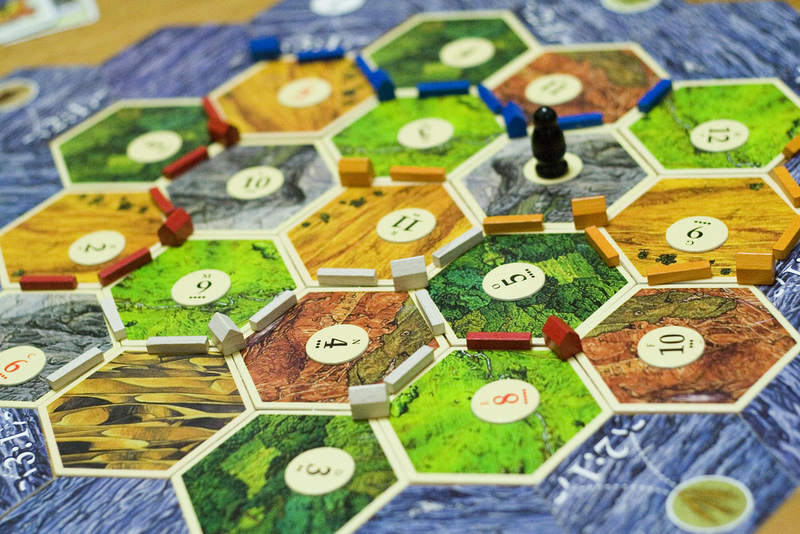 Over the course of the past two decades, Catan has sold nearly 25 million copies worldwide, making it one of the most popular games since Risk or Monopoly. Catan Map Board changes every time you play it. In Catan, each player controls a group of setters trying to develop their settlements on the island of Catan. Players gather resources then use those resources to build their settlements and cities. The first person to gain ten victory points wins. Simple, right? I promise it is! I have even played Catan with my family before and I think it was one of the quickest games that they managed to pick up. There aren’t very many rules or actions that you need to complete on your turn, which makes it perfect for people like my family. Carcassonne was my introduction to gaming and I didn’t even know it at the time. One of my good friends in high school owned it so we would play it frequently when we hung out. I certainly wouldn’t call most of my high school friends “gamers” so Carcassonne was perfect for our group. 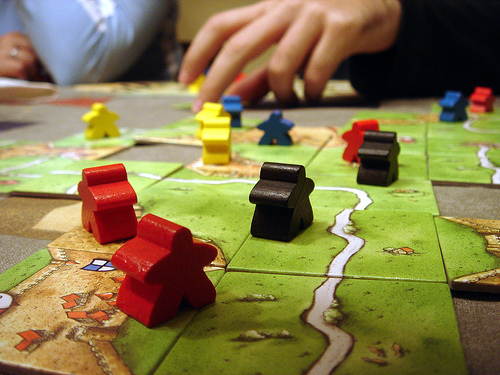 The idea behind Carcassonne is that players are taking on the role of the founders of the historic city, Carcassonne. Players use tiles depicting parts of cities, roads, fields, and monasteries to build the city. They place their “followers” (aka meeples) on the tiles to help with development. The concept of Carcassonne is even simpler than Catan. All you need to do is pick a tile at random, place it on the table to connect it with the rest of the board, then deploy one of your followers and score points. The player with the most points at the end wins. This is the only game on this list that I haven’t played with my family of non-gamers (aka, my very own guinea pigs for this post), but I’m sure it’s only a matter of time before we play it together. Ticket to Ride is one of my favorite games. It is yet another simple concept with a lot of strategy involved. 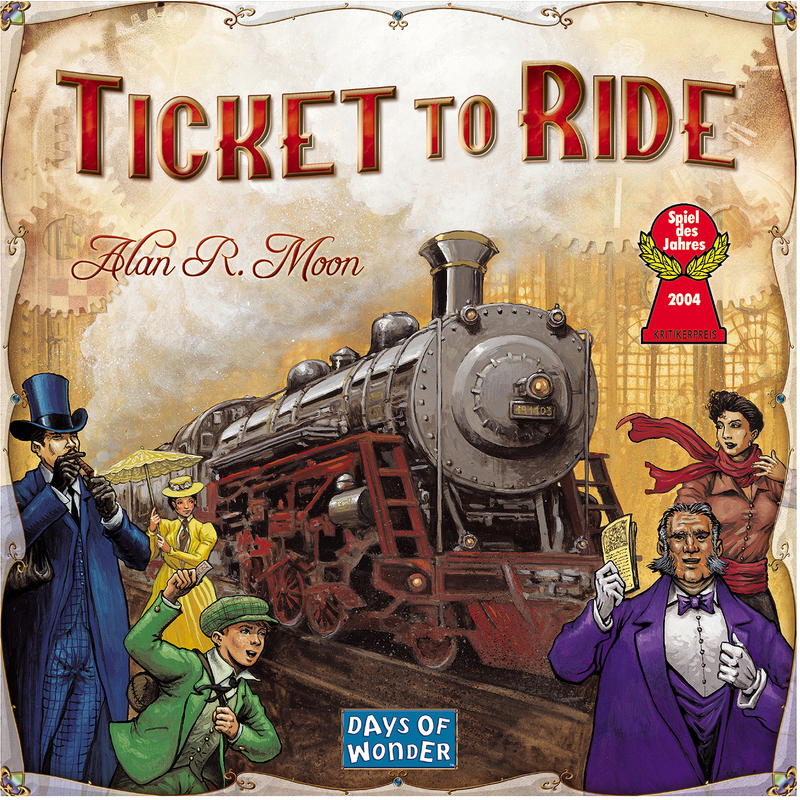 The board is set up like a map of the United States and your goal is to connect different cities through a train route using cards that you receive in the beginning of the game. On your turn you are doing one of three things: picking up cards, placing trains, or choosing a new route. You score points based on the length of your trains in addition to the point value of your routes. Any routes you do not finish at the end of the game is worth negative points. And if you ever get tired of using the United States map, Days of Wonder has created several other maps that each add something new to the game. 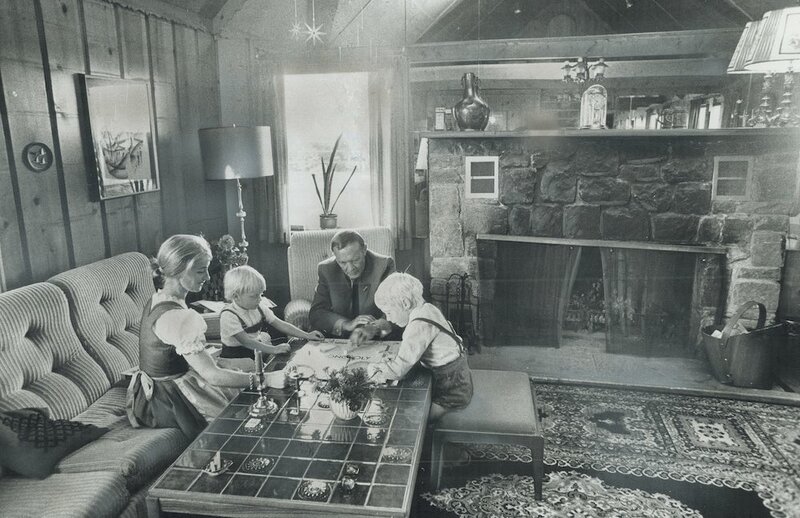 The first time my family came into the café I taught them Ticket to Ride. They liked it enough that we bought it and took it on our beach vacation last summer. My brother, Ridge, was acting very overconfident throughout the game, claiming that he had the greatest strategy. He even kept taking new route tickets. We get to the end of the game and, as we’re going through his routes to double-check that he completed them, we realize that he didn’t finish a single of his routes. In each one, he forgot just a small section, but ultimately never finished any of them. We were all laughing as we subtracted his points and his response was “why are you all laughing?” He ended up with negative forty-one points. Perhaps the simplest of all the games on this list is Tsuro. Tsuro is a game in which the last man standing wins. In it, players place tiles on the board and follow the path on it until they reach the end. If your path takes you off the edge of the board, you lose. If you run into another player, you both lose. The catch is, you may only place tiles in front of your piece. You must strategically place your tiles in a way that you can not only defensively play and avoid the other players, but also offensively play and try to connect your path with another player’s path in a way that forces them to run off the board. 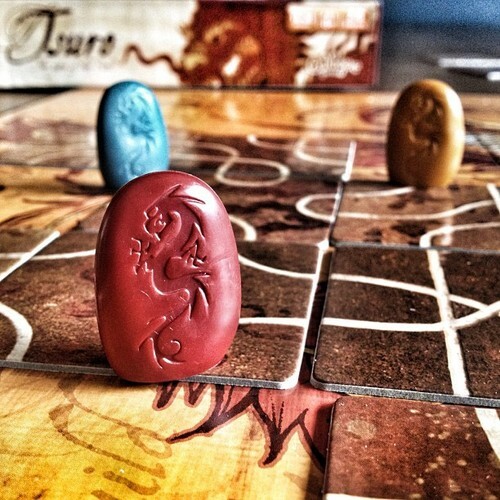 Tsuro (pronounced Suro)a beautiful & simple game to play. When I taught my mom and grandma Tsuro, the strategy part of it simply went over their heads, but it was still a simple enough concept that they didn’t ask very many questions while I was explaining it. I think one of them may have inadvertently run herself off the board due to a combination of bad tiles and not thinking ahead, but I think they still enjoyed it. If you are new to gaming, but want to learn more, try one of these games! I can guarantee that everyone on staff knows how to play at least one of these and would be more than willing to teach you.